Double classrooms are perfect for providing large, standalone learning spaces or to accommodate multiple classrooms in one building. Taking their contemporary design cues from other modular eco-classrooms we produce, double classrooms expand upon this concept and allow schools to cater for a number of functions and uses. Their modular format allows for bespoke design elements which can be expanded upon in the future and means they can be assembled with little disruption to the surrounding school. Modular eco-classrooms are also built to be economical and ecological, costing much less than standard brick and mortar buildings as well as being far more energy efficient. Waterwells Primary Academy were waiting for a new school to be built and needed extra classrooms to accommodate the increasing capacity of their school. 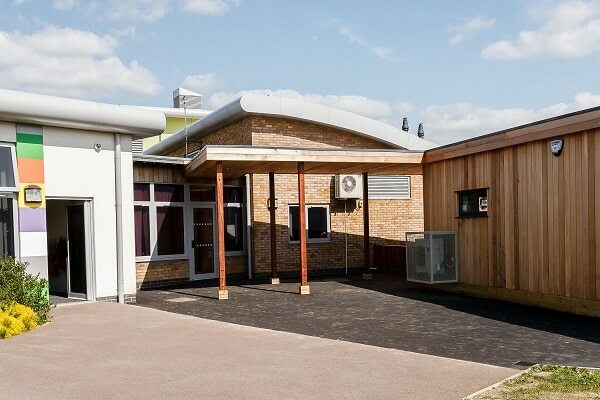 When they contacted TG Escapes, Waterwells Primary Academy asked for a large building which could host multiple classrooms and fit into the existing school environment. 130-200m² Double Classrooms can either be used as a single, large space with removable partitions or as a permanent pair of standard size classrooms. Their large size also means that they can be sub divided further into smaller areas like cloakrooms, toilets and storage space.